Current and former members of the State Automotive Enthusiast Leadership Caucus gathered again this past November to meet with SEMA Action Network (SAN) staff and enjoy the 2018 SEMA Show in Las Vegas. 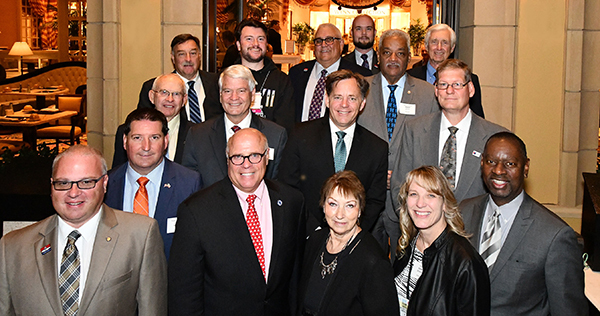 The Caucus, comprised of approximately 750 legislators in all 50 states, is serving to further raise the automotive hobby’s profile in the state capitols. In attendance were (back row, left to right) Representative Patrick Brennan (VT), Delegate Kevin Hornberger (MD), Representative Stan Blake (WY), Delegate Danny Hamrick (WV), Representative Roger Bruce (GA), Representative Chip Campbell (SD); (center row, left to right) Senator Jim Patrick (ID), Senator Randall Hardy (KS), former Senator Josh Newman (CA), Senator Dave Sypolt (WV); (near row, left to right) Caucus Chairman Delegate Gary Howell (WV), Assemblyman Tim Grayson (CA), Representative Steven Howitt (MA), Delegate Terri Sypolt (WV), Senator Elaine Bowers (KS), and Representative Howard Mosby (GA). "I was lucky to buy the Street Rodder Road Tour clone built for the magazine’s 25th Anniversary of Tom McMullen’s famous ’32 Ford roadster," explains Tom Vogele. "Me and my lovely wife Deb have traveled across the country in the black-and-flamed roadster many times. She is an equally knowledgeable car gal and is on the staff of StreetScene with me." Noteworthy trivia: Deb also happens to be the daughter of car customizing legend Darryl Starbird. For the lucky few, one’s desired career path becomes obvious early on. Merging the dream with a personal passion is even rarer. As a lifelong hot rodder, noted vehicle builder and veteran of automotive publications, Tom Vogele has figured out a winning combination. The common thread throughout his journey has been a well-established staple among our community: car magazines! Tom read them as a child from his small hometown in eastern Montana—cover to cover, word for word, sitting atop the family home’s floor heaters late at night with a flashlight. Thanks to those pages and his older brother’s influence, he became hooked on hot rods at about age ten. “As a true automotive bibliophile, I still have them—thousands of car magazines and over 4,000 automotive hardback books,” he details. Without much professional background, Tom entered the world of publications by answering an ad for associate editor posted in the back of Street Rodder magazine. He’d covered a local car show using a pocket camera and found himself moving to the West Coast at the request of founder Tom McMullen. The result was a four-year role with the up-and-coming monthly beginning in 1980. “Then the ‘opportunity of a lifetime’ came along: working for then-unknown Boyd Coddington in his backyard shop!” exclaims Vogele. After a four-year apprenticeship, as well as a stint building street rods on his own, he returned to Street Rodder as editor. 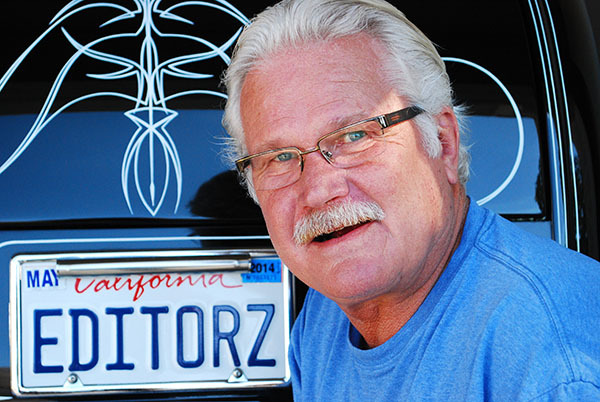 He similarly vowed to return to car building again in 2006—only to be found two years later as editor of StreetScene, official magazine of the National Street Rod Association (NSRA). In this position, he continues to make room in each issue to highlight the SEMA Action Network’s (SAN) legislative cause. Congratulations on your recent, well-deserved induction into the Hot Rod Industry Alliance (HRIA) Hall of Fame, Tom! We’re grateful to you for continuously sharing the efforts of the SAN with NSRA’s loyal readers—our hobby benefits from your action.